Indonesian Scholars Alliance open for repository online.Archives Language and Linguistics is an open-access, biannual, peer-reviewed, and online journal with a strong emphasize on the study of language within the framework of contemporary linguistics in Southeast Asia region. All the author will be contact by administrator to participate to sent the paper. 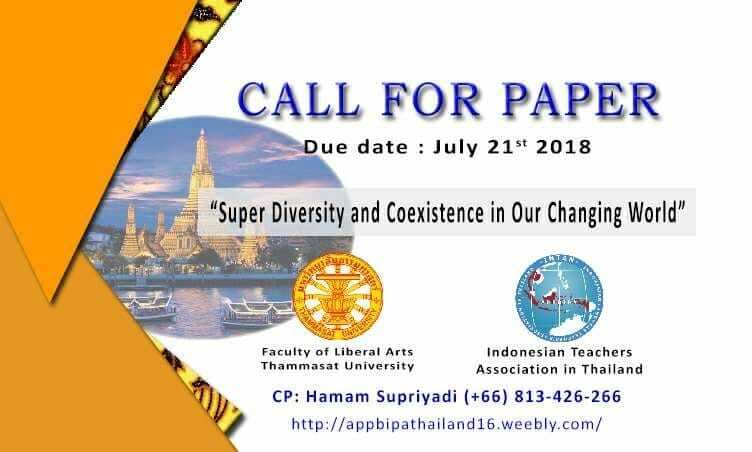 ​A cluster seminar in Indonesian Language Studies is held upon the collaboration between the Faculty of Liberal Arts of Thammasat University (LATU) and APPBIPA-THAILAND (Association for the Teaching and Promotion of Indonesian as Foreign Language in Thailand). This seminar will be held under the annual International seminar of the Faculty of Liberal Arts of Thammasat University (LATU). Book for basic level Indonesian Language. Free order for Thai Lecture or Thai teacher. Please order book by form bellow. Available until July, 2019. The students who take Indonesian Language Course in Thailand for 2nd semester are 655 students. The total students for Academic year 2017/2018 are 7.378 students. The table bellow show increasing amount of students who takes Indonesian Languages course per year. For more info click here. TQF 3 is a lesson plan for teaching Indonesian language in Thailand. TQF 5 is an evaluation used after the program is finish. Sample of TQF 3 and TQF 5 are available now. Download it by following this link below. Indonesian Speech contest have two criteria. The speech contest and story telling. This contest held on June, 3rd 2018 in Indonesian Embassy Bangkok. Thammasart University open Course for public and students. Aj. Hamam coordinate the course colaborating with Intan Lectures.